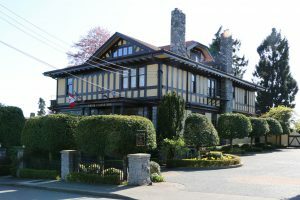 Buildings Associated With Freemasons On Vancouver Island – Victoria – Temple Lodge, No.33, Duncan, B.C. 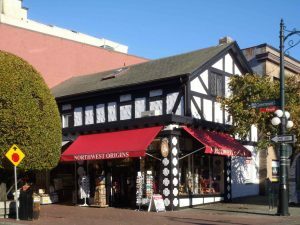 As part of our Vancouver Island Masonic History Project we are compiling a list of Vancouver Island Buildings Associated With Freemasons. 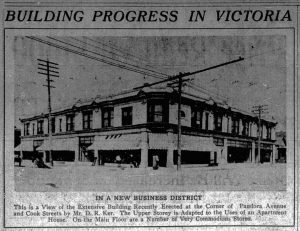 This page on Vancouver Island Buildings Associated With Freemasons – Victoria, B.C. is currently UNDER CONSTRUCTION. We will be adding more buildings as we do additional research. 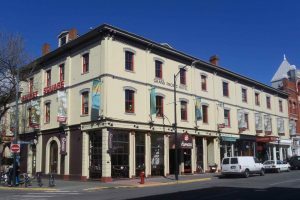 This historic building at 901-905 Government Street in downtown Victoria was originally built in 1858 as Victoria’s first brick hotel. It was purchased by Stephen Jones, circa 1900. In 1913 Stephen Jones added a new structure to the rear of this building at 602 Courtney Street. 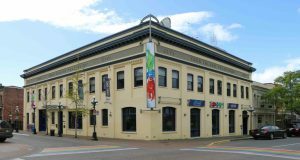 Both buildings are still legally consolidated for tax purposes and both are listed together on the Canadian Register of Historic Places. 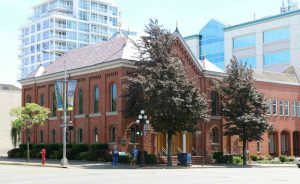 Congregation Emanu-El Synagogue, 1461 Blanshard Street, Victoria, B.C. 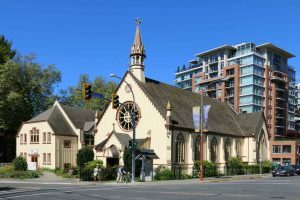 Congregation Emanu-El Synagogue, 1461 Blanshard Street. Built in 1863. Victoria Freemasons laid the cornerstone in 1863. Lumley Franklin, Victoria’s second Mayor and a Charter member of B.C.’s first Masonic lodge, was Congregation Emanu-El President and raised funds for the building’s construction. 1117-1129 Wharf Street was once the business premises of Robert Paterson Rithet‘s firm, R.P. Rithet & Company. 1117-1129 Wharf Street was the business premises of R.P. Rithet & Company, owned by Robert Paterson Rithet, a member of Vancouver & Quadra Lodge No. 2. Designed and built in 1876 by for Reverend (later Bishop) Edward Cridge and the Reformed Episcopal Church by architect John Teague, a member of Victoria-Columbia Lodge No. 1. Designed and built in 1878 by architect John Teague, a member of Victoria-Columbia Lodge No. 1. There was a major addition to the west end of the building in 1909. 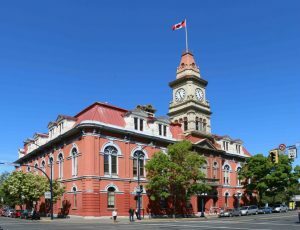 Victoria City Hall – designed and built in three stages between 1878 and 1891 by architect John Teague, a member of Victoria Columbia Lodge No. 1 in Victoria. John Teague also served as Mayor of Victoria. 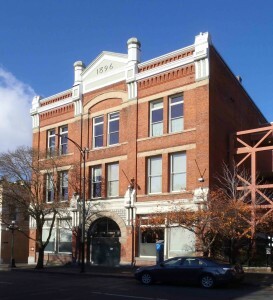 530-540 Johnson Street – built in 1879 by Giacomo Bossi, a member of Vancouver & Quadra Lodge No. 2. Giacomo Bossi used it as the Grand Pacific Hotel. 530-540 Johnson Street is listed on the Canadian Register of Historic Places. 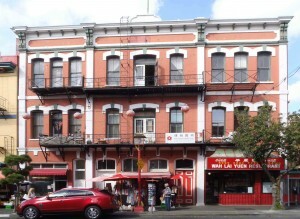 Designed and built in 1885 for the Chinese Consolidated Benevolent Association by architect John Teague, a member of Victoria-Columbia Lodge No.1 in Victoria. 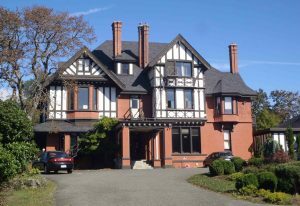 1003 Vancouver Street was designed and built in 1885 by architect John Teague (1883-1902), a member of Victoria-Columbia Lodge No. 1, for Charles Hayward (1839-1919), a member of Vancouver & Quadra Lodge No. 2. Both John Teague and Charles Hayward served as Mayor of Victoria. 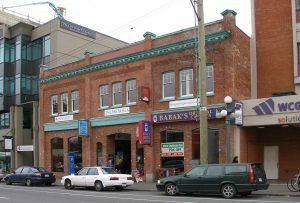 1003 Vancouver Street is listed on the Canadian Register of Historic Places and the Victoria Heritage Registry. Gyppeswyck, originally the home of Alexander Alfred Green, designed by architect William Ridgway Wilson and built by contractor George Mesher. Now part of the Art Gallery of Greater Victoria. 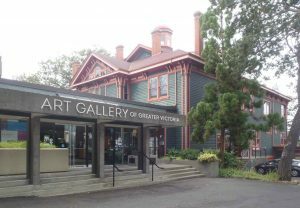 1040 Moss Street, now part of the Art Gallery of Greater Victoria. Gyppeswyck, now known as the Spencer Mansion, was built in 1888 for Alexander Alfred Green (a Freemason) by architect William Ridgway Wilson (a Freemason) and building contractor George Mesher (a Freemason). Also see 1210-1216 Broad Street, which was built for Alexander Alfred Green in 1889 by architect/builder Thomas Trounce, a Past Grand Master. 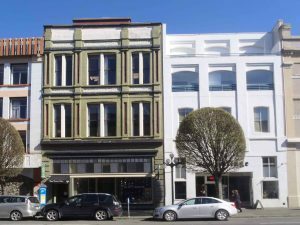 This Heritage Building at 1401 Government Street/606-614 Johnson Street in downtown Victoria was built in 1888 as a store for Edward G. Prior’s hardware business, E.G. Prior & Co. 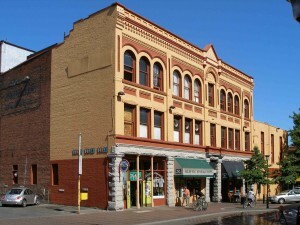 Prior Building, 1401 Government Street/606-614 Johnson Street was built in 1888 by architect Leonard Buttress Trimen for Edward Gawlor Prior (1853-1920), who used it for his hardware business, E.G. Prior & Co.
Edward Gawlor Prior was a member of Victoria-Columbia Lodge No. 1. This building is listed in the Canadian Register of Historic Places. Also see 620 St. Charles Street. 1210-1216 Broad Street – built in 1889 by architect/builder Thomas Trounce (a Past Grand Master) for Alexander Alfred Green (a member of Victoria Columbia Lodge No. 1). The building was later used by Robert Burns McMicking and Edgar Crow Baker (both Past Grand Masters), who set up Victoria’s first telephone exchange in this building. 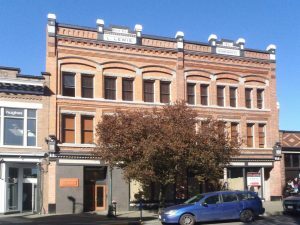 1407 Government Street was built in 1889 by the Brackman-Ker Milling Company, which was owned by David Russell Ker, a member of Victoria-Columbia Lodge No. 1. Also see 1420 Broad Street, built by the Brackman-Ker Milling Company in 1907. 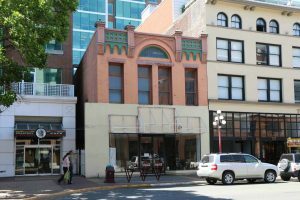 566-570 Yates Street, Victoria, B.C. Built for Lewis Lewis by architect Thomas Hooper in 1891. The “L.Lewis” on the cornice refers to Lewis Lewis. 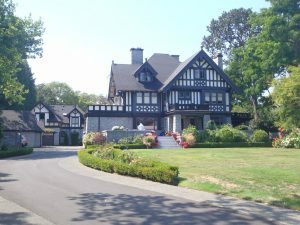 Designed and built in 1891 by architect Thomas Hooper for Lewis Lewis (died 1904), a member of Vancouver & Quadra Lodge No. 2 in Victoria. 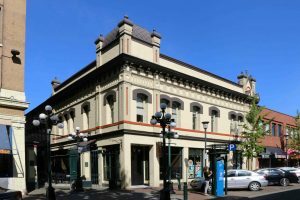 Duck’s Building, Broad Street, Victoria, B.C. Built in 1892 for Simeon Duck. Duck’s Building at 1314-1322 Broad Street was built in 1892 by architect William Tuff Whiteway (a Freemason) for Simeon Duck (1834-1905), Past Grand Master of B.C. The Board of Trade Building, 31 Bastion Square, Victoria, B.C. Designed by architect Alexander Maxwell Muir in 1892. 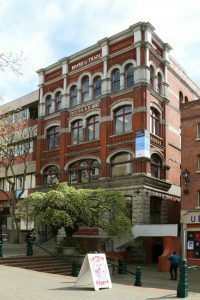 Board of Trade Building, 31 Bastion Square, Victoria B.C. 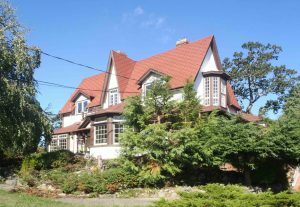 Designed and built in 1892 by architect Alexander Maxwell Muir, a member of Vancouver & Quadra Lodge No. 2 in Victoria. 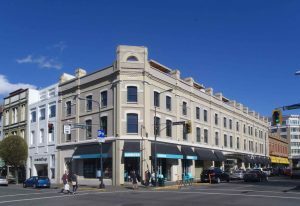 Thomas Shotbolt‘s former store, now 585-587 Johnson Street, Victoria, B.C. Designed and built in 1892 by architect John Teague for Thomas Shotbolt, who used it for his drug store. It was originally a two storey building, with an upstairs apartment for Thomas Shotbolt’s family. The second storey was removed in the 1950’s. Thomas Shotbolt was a member of Victoria-Columbia Lodge No. 1. Designed and built in 1894 by architect William Ridgway Wilson for Hewitt Bostock, a member of Victoria-Columbia Lodge No. 1. Renovations were done to the house in 1915 by Victoria architect Samuel Maclure. 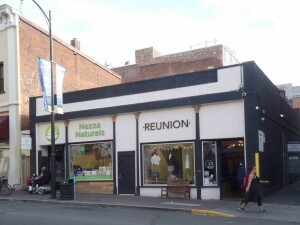 Simon Leiser‘s former warehouse at 524 Yates Street in Victoria was converted to condos in 2011. 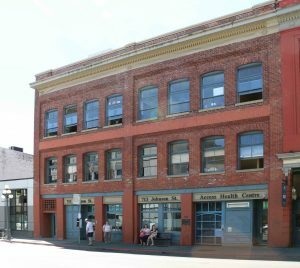 This building at 524 Yates Street was built in 1896 by architect A.C. Ewart as a warehouse and office for Simon Leiser & Co., a wholesale grocer. Simon Leiser (1851-1917) was a member of Vancouver & Quadra Lodge No. 2 in Victoria. The building was renovated into condominiums is 2011. 727-729 Yates Street was designed and built in 1897 by architect John Teague for real estate investor Dr. F.W. Hall. 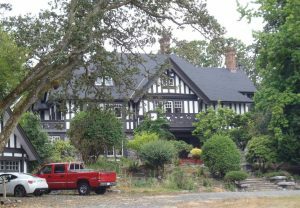 1770 Rockland Avenue, built in 1905 by architect Samuel Maclure for Biggerstaff Wilson, a member of Vancouver & Quadra Lodge No. 2. Also see 1407 Government Street, which was also built by the Brackman-Ker Milling Company. 855 Pemberton Road, Victoria, BC. Built in 1906-1907 for Alfred Cornelius Flumerfelt , a member of Victoria Columbia Lodge No. 1. Also see 906 Pemberton Road. 713-715 Johnson Street was built in 1908 by architects Thomas Hooper and C. Elwood Watkins for William James Mable, who used it for his carriage making business, Mable Carriage Works. William James Mable was a member of Victoria Columbia Lodge No. 1 in Victoria. 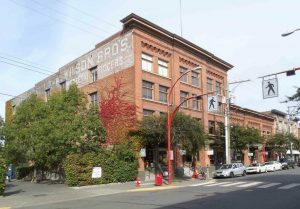 532 Herald Street, built in 1908-1909 as a warehouse for Wilson Brothers. It is now condominiums. 532 Herald Street and 536 Herald Street were built in 1908-1909 for Wilson Brothers and B. Wilson Co. respectively. Biggerstaff Wilson, a member of Vancouver & Quadra Lodge No. 2, was a principal of both companies. Also see 1770 Rockland Avenue. 532 Herald Street (left) and 536 Herald Street (right), built in 1908-1909 for Wilson Brothers and the B. Wilson Co. Biggerstaff Wilson was a principal of both companies. 532 Herald Street and 536 Herald Street were built in 1908-1909 for Wilson Brothers and B. Wilson Co. respectively. Biggerstaff Wilson, a member of Vancouver-Quadra Lodge No. 2, was a principal of both companies. 512-514 Fort Street was built in 1909 by architect Francis Rattenbury as an investment property for David Russell Ker, a member of Victoria-Columbia Lodge No.1. 512-514 Fort Street is listed on the Canadian Register of Historic Places. 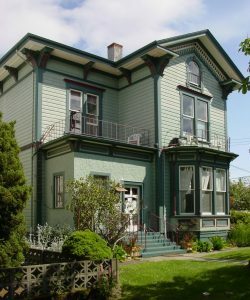 Simon Leiser’s house at 1005 St. Charles Street, Victoria, B.C. 1005 St. Charles Street was designed and built i910-1911 by architect Samuel Maclure for Simon Leiser, a leading figure in late 19th and early 20th century Victoria business. Simon Leiser was a member of Vancouver & Quadra Lodge No. 2 in Victoria. 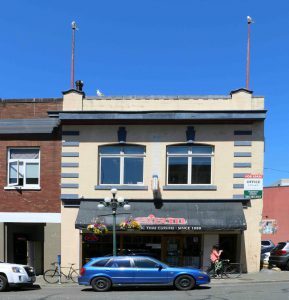 This building is on the City of Victoria Heritage Registry. 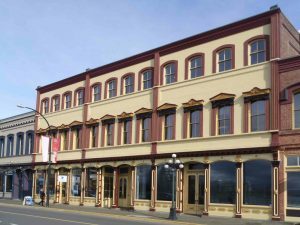 Simon Leiser was also instrumental in the construction of the Royal Theatre, 805 Broughton Street, in 1913. 906 Pemberton Road, Victoria, BC. 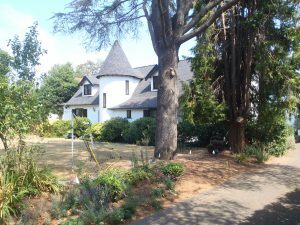 Built in 1910-1911 by architect Samuel Maclure for Edward and Lola Grierson. Alfred Cornelius Flumerfelt moved here when he married Lola Grierson in 1926. Alfred Cornelius Flumerfelt was a member of Victoria-Columbia Lodge No. 1. Also see 855 Pemberton Road. 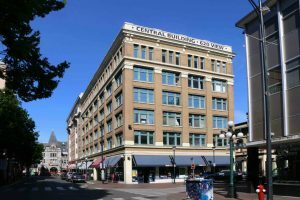 The Central Building was built in 1911 by architect Jesse Milton Warren for Thomas Shanks McPherson, a Past Master of Victoria-Columbia No. 1. 620 St. Charles Street was built in 1911 by architect William Ridgway Wilson for Col. Edward Gawlor Prior., a member of Victoria-Columbia Lodge No. 1. Built in 1911 for David Russell Ker by architect William Ridgway Wilson. 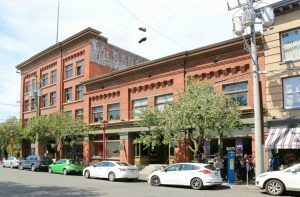 Originally called the Executive Building but became much bettter known as Wellburn’s Grocery, which was founded and operated by Matthew B. Wellburn. Built in 1912 as the family home of Matthew B. Wellburn, who lived in this house until his death on 1969. 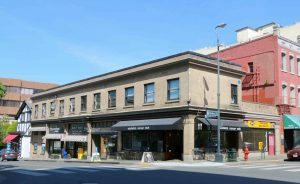 919 Fort Street was built in 1912 as an investment property by Thomas Catterall, one of Victoria’s leading contractors and builders. Thomas Catterall was a member of Vancouver & Quadra Lodge No. 2 in Victoria. He seems to have built 919 Fort Street for himself. 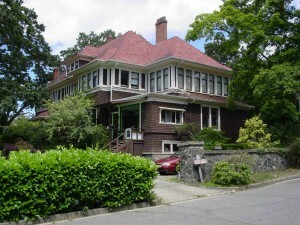 1320-1324 Blanshard Street was built by architect Thomas Hooper for Max Leiser, a member of Vancouver & Quadra Lodge No. 2 in Victoria. The building originally opened in 1913 as the Kaiserhof Hotel, a German themed hotel and restaurant. 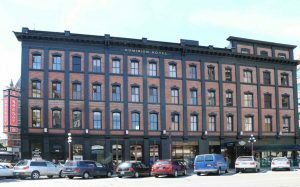 1320-1324 Blanshard Street is listed on the Canadian Register of Historic Places under the name Kaiserhof Hotel. 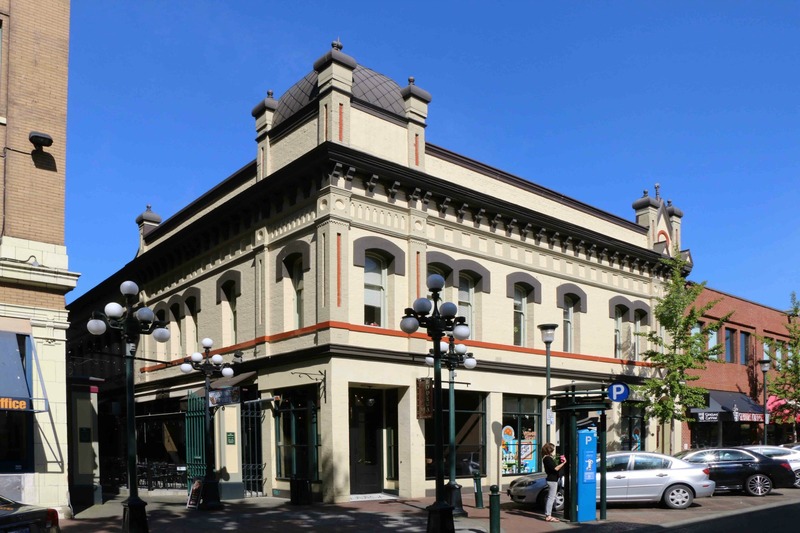 Royal Theatre – 805 Broughton Street – the primary figure behind planning, financing and building the Royal Theatre was Simon Leiser (1851-1917), a member of Vancouver & Quadra Lodge No. 2 in Victoria. 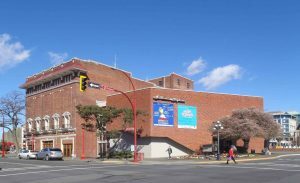 The Royal Theatre was formally opened in 1913 by B.C. Premier Sir Richard McBride, who was also a Freemason. 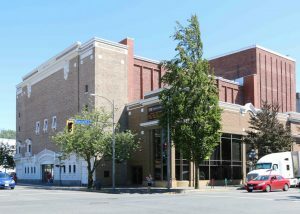 The Royal Theatre is on the Canadian Register of Historic Places. 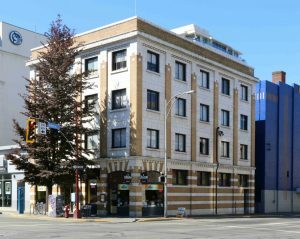 600-610 Courtney Street in downtown Victoria was built in 1913 for Stephen Jones, a Victoria hotelier who also served as Grand Master of B.C. & Yukon in 1924-1925. It was built as an addition to 901-905 Government Street, which was also owned by Stephen Jones. 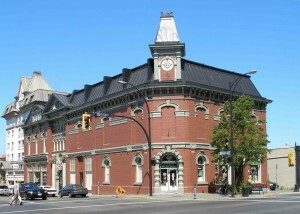 Both buildings are legally consolidated into a single building and are listed on the Canadian Register of Historic Places. The McPherson Playhouse was built in 1914 by architect Jesse Milton Warren for Thomas Shanks McPherson, a Past Master of Victoria-Columbia Lodge No. 1. We will be adding more buildings to this page in due time.